Mason James is the responsible one who stayed behind to run the ranch while his brother, Rock, took off to play professional hockey. Women have used him before to get to his brother—and Mason intends never to get burned again. But after he meets quirky Tessa Kane at his brother's wedding, Mason discovers he's ready to take a chance on love. Tessa Kane is a reporter on the verge of losing a job she desperately needs—unless she's clever enough to snag a story on the famous Rockford James. 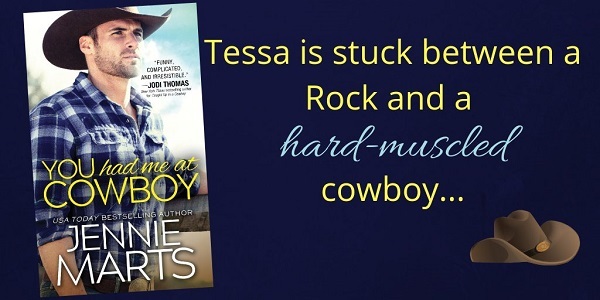 But when she falls for her subject's brother, she's caught between a rock and a hard-muscled cowboy. What will happen when Mason finds out who she really is? This is the second book in this series and while it's not necessary to read book one to understand, it will help with character development. Mason is a rugged, true-to-form cowboy. He loves his ranch. He loves his family. What he doesn't love is feeling like he's being used as a stepping stone for people to reach his famous, NHL star brother. Mason loathes liars. When his brother gets married, Mason has to hear from everyone around that he will be next... that there will be someone out there for him. There's only so much Mason can take before he's ready to leave the festivities. Tessa is down on her luck. So down on her luck but hoping to catch a break. With her grandma accidentally sending away their entire savings to the Nigerian prince scam, Tessa knows that she needs to figure out how to save their house. Also, Tessa isn't the most confident woman. When she finds herself stood up at a party, she thinks it can't get any worse. Then she loses her job... Just great. As she is pondering how much worse the night could get, she happens to wander into Mason. The sparks that fly between these two are amazing. I loved how they bantered back and forth. Tessa is nervous because while she is not outright lying, she is lying by omission. She also knows how much Mason hates liars. Mason can't help but be overjoyed that he found Tessa. Could this be his luck turning around? I loved how this story unfolded. The secondary characters were hilarious and helpful when necessary. I also really enjoyed watching Tessa and Mason get to know each other. They both had some growing to do and in the end, had to figure out if what the felt for each other was worth fighting for. I really hope there is another book! This is Mason's story. Mason has a classic case of what I like to refer to as "middle child syndrome." Not as a good as his older brother and not as a cute as his younger brother. Granted, Rock is a pro hockey player and has lived a life outside of their small hometown in rural Colorado. Mason is running the ranch, doing everything he can to keep it operational with the help of his mother and younger brother. He's always felt that he has lived his life in Rock's shadow. Especially when it comes to women. More than once, a woman has used him as a way to get closer to his brother. When he meets Tess, he's open and honest about the fact that he hates reporters and being lied to. And of course, Tess is lying to him. She has to if she wants to keep her job as a reporter for a magazine. She has to get the scoop on Rock's engagement or she's out of a job – for good this time. Tess is fighting demons of her own, and trying to save her grandmother's house from foreclosure by doing something that she truly hates: infiltrating a nice family all so she can keep the roof over her head. I enjoyed the book, but I felt the ending drama with her grandmother was a little far-fetched and rushed. 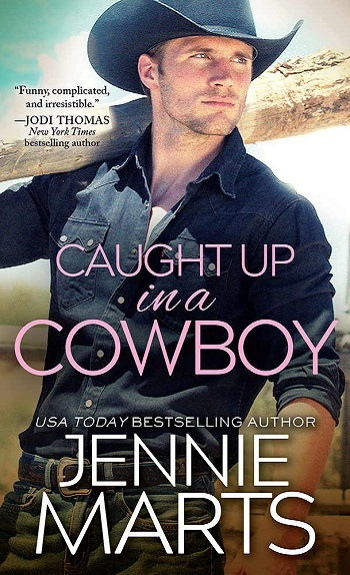 For reviews & more info, check out our Caught Up in a Cowboy post. 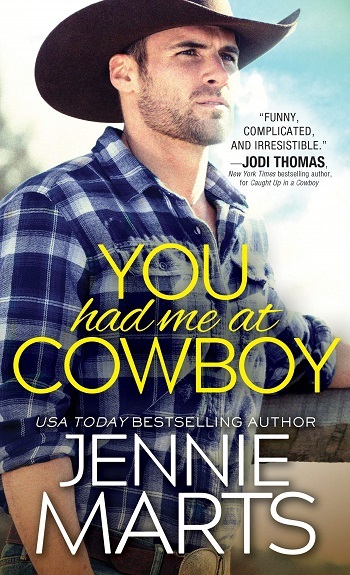 Reviewers on the Wicked Reads Review Team were provided a free copy of You Had Me at Cowboy (Cowboys of Creedence #2) by Jennie Marts to read and review.